According to the Bladder and Bowel Foundation, 2011, over 9 million women have some form of bladder problem. That is a lot! And yet whilst the world and media alike are now pretty much open to talking about periods and sanitary wear, it is only now that incontinence products are being more actively promoted on television. Why is it the last taboo, for men and women alike? Urgency related - involuntary leakage accompanied by or immediately preceded by urgency. "I've got to go, NOW"
Mixed urinary incontinence - a mixture of the two aforementioned definitions; such as sneezing combined with urgency. For me, as a young woman pregnant with my third baby, the most typical form of urinary incontinence I could experience is stress-related. This is exceedingly common, particularly after subsequent pregnancies. It is nothing to be ashamed of. Afterall whilst pregnant you are carrying excess weight and the weight of the baby often presses on the bladder. Previous births are more than capable at weakening the pelvic floor muscles which are key to bladder control. Hence why midwives are keen to reinforce the importance of keeping up with regular pelvic floor exercises, known as Kegal exercises. 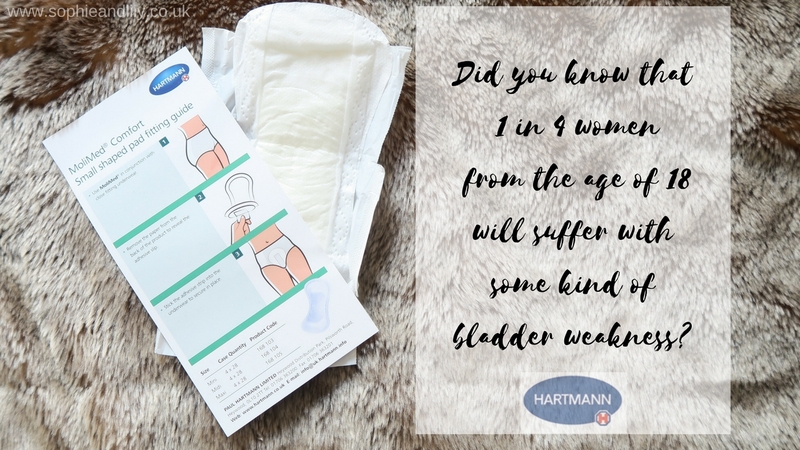 Not only do toned pelvic floor muscles support the bladder and the bowel (think of them being a hammock supporting the bladder and bowel) but they also assist normal bladder and bowel function and prevent leakage, plus contribute to sexual function. Following a normal delivery and an assisted delivery with forceps I am not ashamed to admit that after a particularly substantial sneeze that I can leak. I will maintain my kegal exercises throughout the remainder of my pregnancy and beyond. Many women are keen to get their pre-natal body and abdomen back in shape quickly after birth but are quick to neglect these pretty important pelvic floor muscles which need working out even more so. 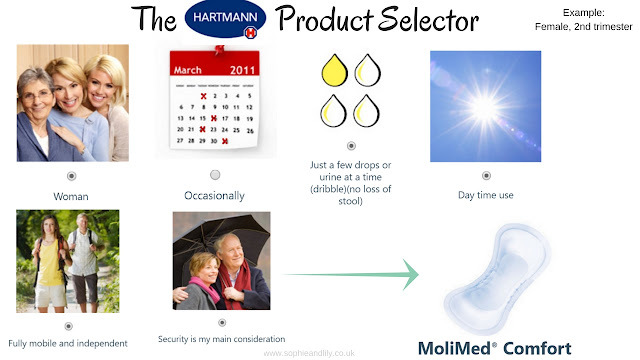 Hartmann's supply a range of incontinence products, but the ones which could suit pregnant women the best could be the MoliMed Comfort, which is a discreet shaped pad designed for slight incontinence (75ml capacity). They are soft and feature no leaks gussets and whilst they aren't as thin as a regular pantiliner, these are still lightweight and slim. Use the product selector to choose which pad is best for you. There is something suitable for everyone's particular needs. Example of the Hartmann Product Selector results for a female in 2nd trimester of third pregnancy. Collaborative blog: all thoughts and opinions expressed are my own.